Aperitif … from a jug. Oh, hey. Thanks so much for all of your kind words and support so far. I’m so glad you’re here in my kitchen. Stay for a while. I thought for your first real glimpse into my kitchen, I’d offer an aperitif of sorts before a full-on cooking demo. But I believe in generous portions. So this aperitif comes in two jugs. Last week, I infused two types of vodka — a blood orange vodka and a cucumber vodka. I’ll show you how to do that quite soon so you can start experimenting with your own flavors. 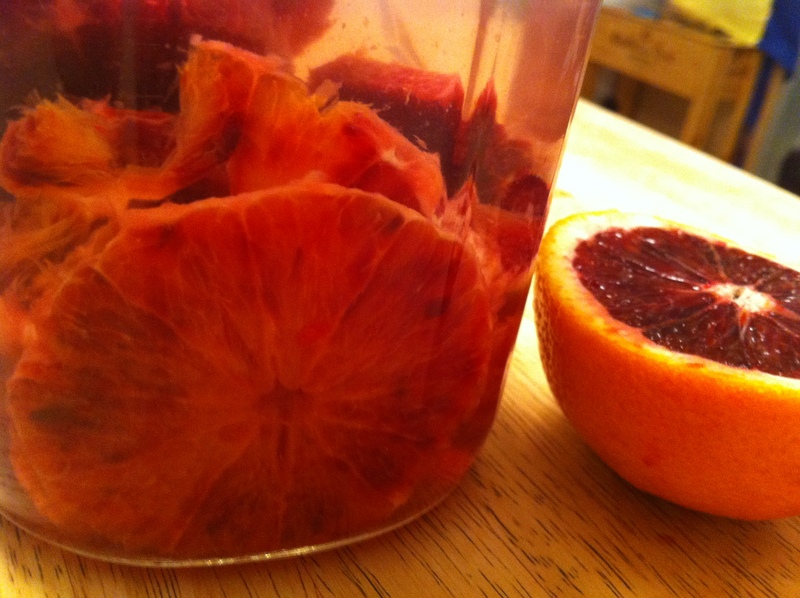 But let’s cut to the chase: The fun part about infusing your own vodka is the taste-testing. In the spirit of really having you in my kitchen, I offer you my first video — unscripted, off-the-cuff chit-chat with you as I prepare food and drinks. This entry was posted in Cocktails, Videos by Cavan Reagan Reichmann. Bookmark the permalink. Classy. So very, very classy. You had me smiling AND wanting to drink from a jar with a straw. Great job, Cavan! Thanks, Emily! Drinking from a jar with a straw is an overlooked pastime. Help me start the trend. The tie is what makes it ALL believable. Stellar idea infusing vodka! And I LOVE jars! You’ve made a beautiful union here Cav! Having been a guest at your impromptu dinner party, (I’m assuming that was us…) I have to say that the cucumber vodka was my favorite. Delicious! We can’t wait to try to make some of our own, then we can serve them to you guys when you come visit. I want to be your neighbor. Badly. You’re a natural, C! Yay! I appeared complete with a magical fairy sound effect:) If only I could be there to sample it with you. Maybe I’ll wear a tie to the Fair this year. Try a beet vodka infusion! Peel ’em, chuck ’em in. The vodka turns blood red. Mix it with ginger-beer, a splash of apple cider, and a lime. It is the weirdest thing you will may ever drink, but it’s delicious…if you like beets that is. That’s a good one! I’ve never heard of it before, and I love beets. I’ll have to try it. Thanks!